A while back, I made a post encouraging people to get fed up every now and then and figure out a better way of doing something. Well, tonight I take my own advice. 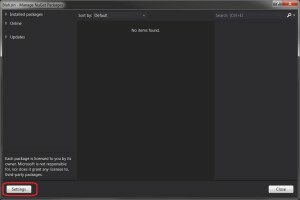 I am sick and tired of rifling through old projects to find code that I copy and paste into literally every non-trivial .NET solution that I create. 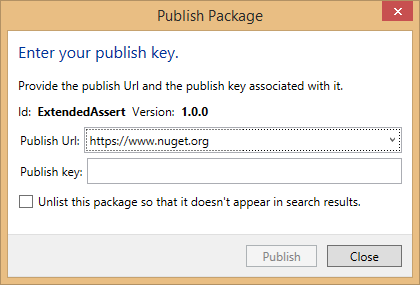 There’s a thing for this, and it’s called Nuget. I use it all the time to consume other people’s code, libraries and utilities, but not my own. Nope, for my own, I copy and paste stuff from other projects. Not anymore. This ends now. 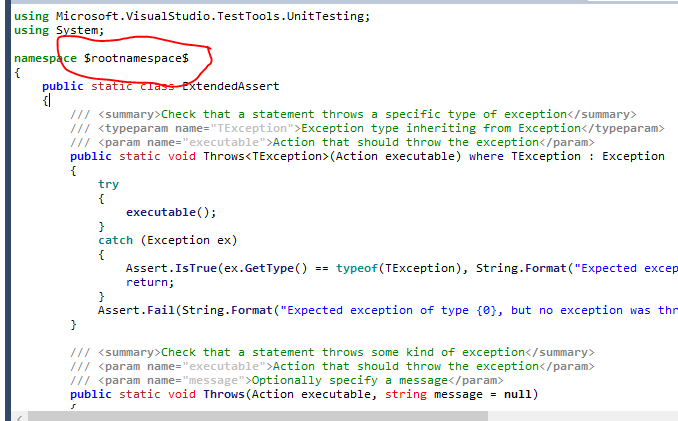 Now, let’s put this on Nuget somehow. I found my way to this link, with instructions. Having no idea what I’m doing (though I did play with this once, maybe a year and a half ago), I’m going with the GUI option even though there’s also a command line option. So, I downloaded the installer and installed the Nuget package explorer. Next up, I ran Tools->Analyze Package. No issues found. Not too shabby for someone with no idea what he’s doing! Now, to go for the gusto — let’s publish this sucker. File->Publish and, drumroll please…. ruh roh. 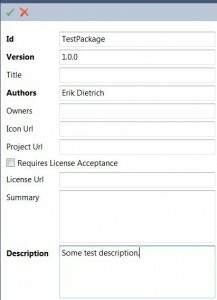 I need something called a “Publish Key” to publish it to nuget.org. Your API key provides you with a token that identifies you to the gallery. Keep this a secret. You can always regenerate your key at any time (invalidating previous keys) if your token is accidentally revealed. Emphasis mine — turns out my instinct was right. And, sorry for the freewheeling nature of this post, but I’m literally figuring this stuff out as I type, and I thought it might make for an interesting read to see how someone else pokes around at this kind of experimenting. Okay, now to see if I can actually get that thing. 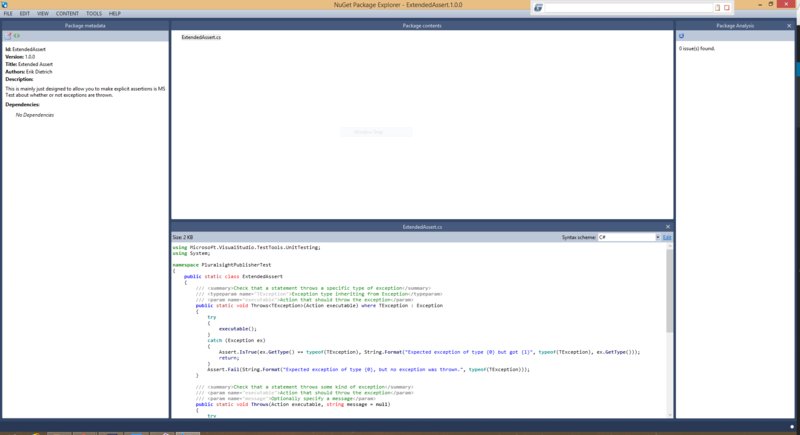 I’m going to create a brand new test project in Visual Studio and see if I can install my beloved ExtendedAssert through Nuget, now. After a bit of googling, I found this stack overflow question. Let’s give that a try, optimistically upvoting the question and accepted answer before I forget. I right clicked in the “package contents” window, added a content folder, and then dragged ExtendedAssert into that folder. In order to re-publish, I had to rev the version number, so I revved the patch decimal, since this is a hot patch to cover an embarrassing release if I’ve ever seen one. No time for testing on my machine or a staging environment — let’s slam this baby right into production! Then, according to the link, I also need to change the filename to ExtendedAssert.cs.pp (this took me another publish to figure out that I won’t bore you with). Let’s rev again and go into production. Jackpot! Don’t believe me? Go grab it yourself. A few things I’ll note at this point. 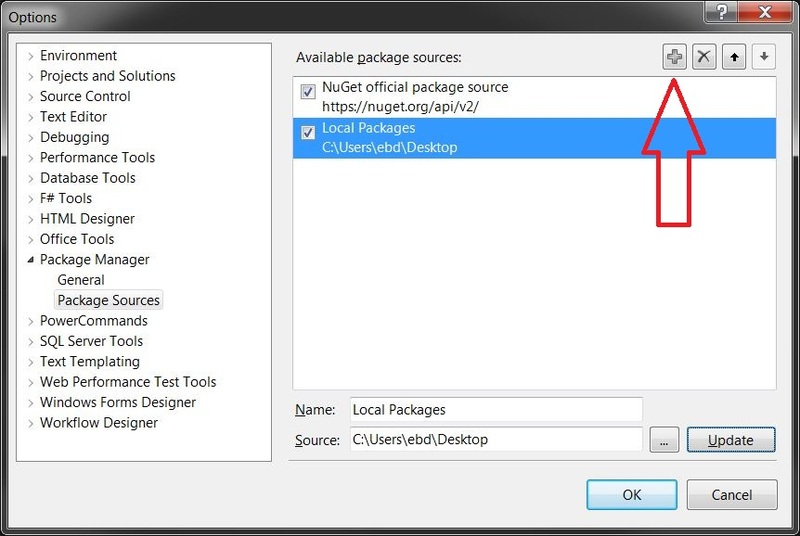 First off, I recall that it’s possible to save these packages locally and for me to try them before I push to Nuget. I should definitely have done that, so there’s a meta-lesson here in that I fell into the classic newbie trap of thinking “oh, this is simple and it’ll just work, so I’ll push it to the server.” I’m three patches in and it’s finally working. Glad I don’t have tens of thousands of users for this thing. 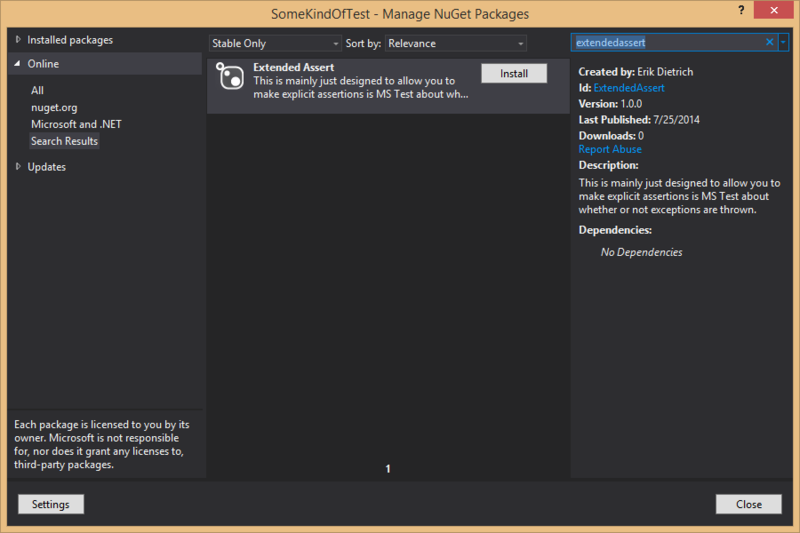 But the biggest thing to take away from this is that Nuget is really easy. I had no idea what I was doing and within an hour I had a package up. For the last 5 years or so, every time I start a new project, I’d shuffle around on the machine to find another ExtendedAssert.cs that I could copy into the new project. If it’s a new machine, I’d email it to myself. A new job? Have a coworker at the old one email it to me. Sheesh, barbaric. And I put up with it for years, but not anymore. 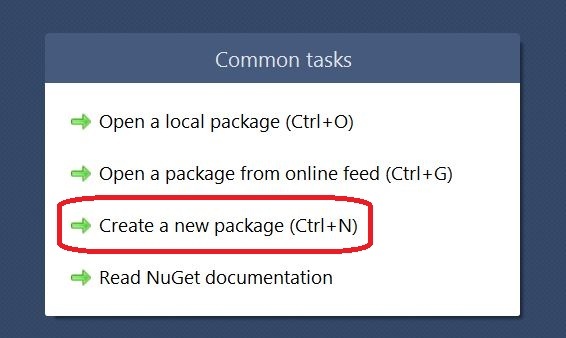 Given how simple this is, I’m going to start making little Nuget packages for all my miscellaneous source code goodies that I transport with me from project to project. I encourage you to do the same. Go to codeplex and download the package explorer tool. 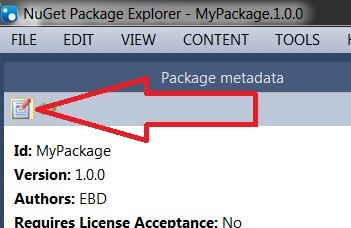 Click the green check mark to exit the metadata screen and then right-click in the “Package Contents” pane. 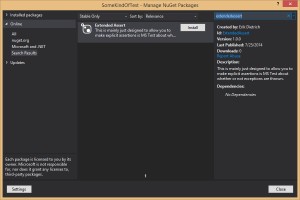 Select “Add Content Folder.” The “Content” folder is a structure of files that will mimic what Nuget puts in your solution. Now, right click on the “Content” folder and select “Add New File.” Name the file “Readme.txt” and add a line of text to it saying “Hello.” Click the save icon and then the “back” arrow next to it. 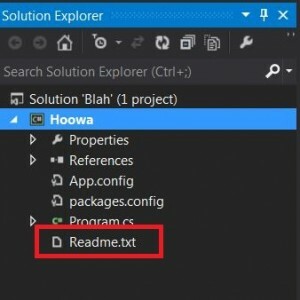 Now go to the file menu at the top and select “Save,” which will prompt you for a file location. Choose the desktop and keep the default naming of the file with the “nupkg” extension. 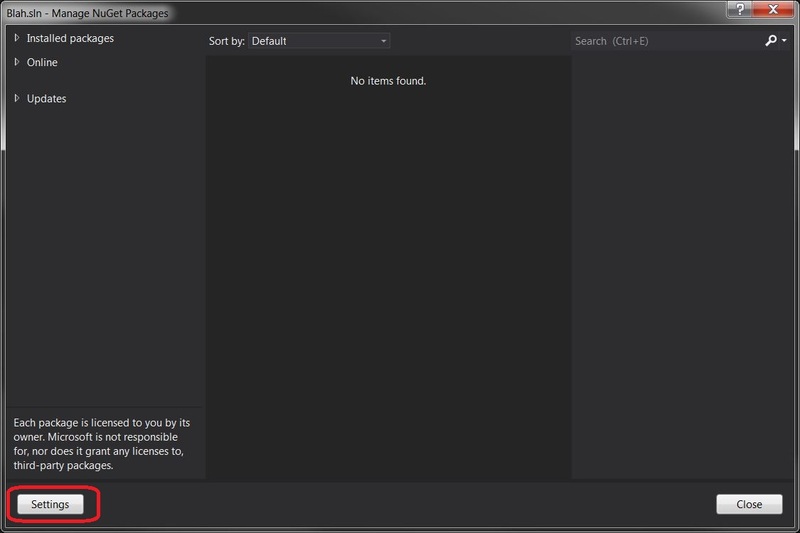 Close the package explorer. Create a new solution in Visual Studio into which we’re going to import the Nuget package. Observe that source (or text or whatever) files are installed to your solution as if they were MSI installs. You can install them, uninstall them, and update them all using a GUI. 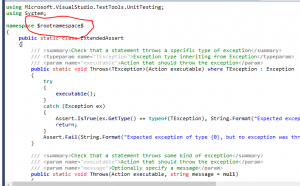 Source code is thus turned into a deliverable that you can consume without manual propagation of the file or some kind of project or library include of some “CommonUtils” assembly somewhere. This is a very elegant solution. It shouldn’t take a ton of extrapolation to see how full of win this is in general, especially if you create a lot of new projects such as a consulting shop or some kind of generalized support department. 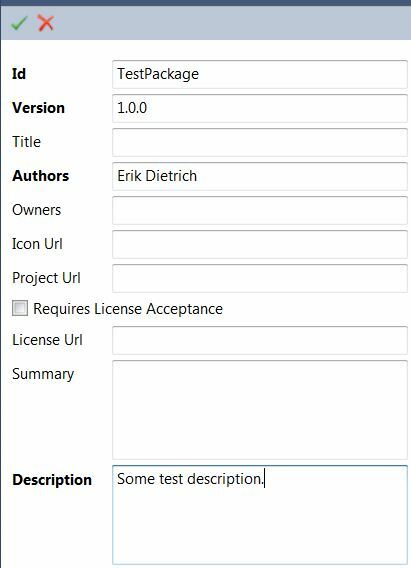 Rather than a tribal-knowledge mess, you can create an internal Nuget feed and setup a sort of code bazaar where people publish things they think are useful; tag them with helpful descriptors; and document them, allowing coworkers to consume the packages. People are responsible for maintaining and helping with packages that they’ve written. Have two people do the same thing? No worries–let the free market sort it out in terms of which version is more popular. While that may initially seem like a waste, the group is leveraging competition to improve design (which I consider to be an intriguing subject, unlike the commonly embraced anti-pattern, “design by committee,” in which people leverage cooperation to worsen design). But even absent any broader concerns, why not create a little Nuget feed for yourself, stored in your Dropbox or on your laptop or whatever? At the very least, it’s a handy way to make note of potentially useful things you’ve written, polish them a little, and save them for later. Then, when you need them, they’re a click away instead of a much more imposing “oh, gosh, what was that one thing I did that one time where I had a class kinda-sorta like this one…” away.